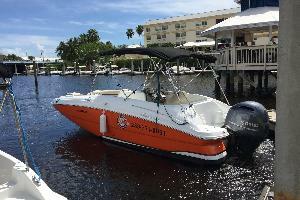 Gorgeous Dalis II Twin Yamaha Engine boat under the Captain's Gene Luciano command. It gives you a descent off shore fishing experience. You can take up to 6 ppl on this event including yourself. An immaculate in-shore or near-shore experience for up to 4 participants on one of our brand new Sportsman Fishing boats with extremely skilled Captain. Enjoy a 8 hour fishing charter with one our experienced Captains, either on a Backwater or near-shore charter. 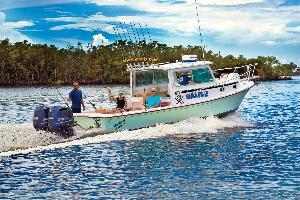 You charter price includes all rods, tackle, bait and license for up to six passengers. Think you've done and seen most everything in Naples? Well, think again! 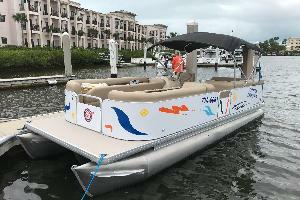 See the natural beauty and learn the history of Old Naples on the newest, hippest, innovative personal transporter. Gorgeous, just in 15 seater, 24.86" tritoon. She is 2017 with Blue tooth stereo and Lowrance GPS/Depth Finder. Boat is comfortable with a great upholstery. This one is located by our Hyatt House of Naples location. Beautiful Brand New 2018 TriToon boat with 115 HP Yamaha Four Stroke. WOW she is pretty! 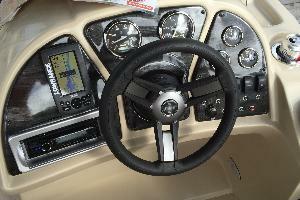 It's equipped with Simrad GPS-depth finder and a bluetooth stereo. 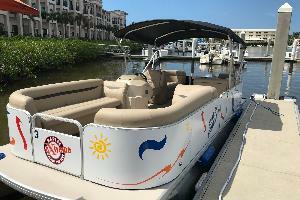 Tour our beautiful waters on a beautiful 2015 Tritoon boat! 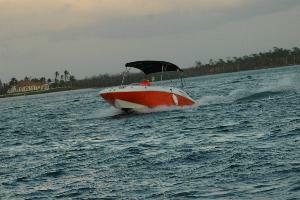 Powered by a 115 HP Yamaha Four Stoke. She is fast, soft, smooth, and comes with all the bells and whistles. 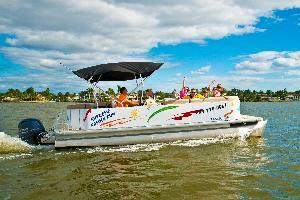 Tour our beautiful waters on a beautiful 2015 Tritoon boat! 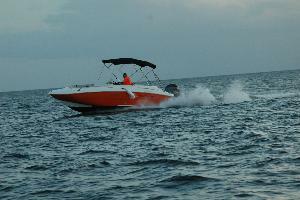 Powered by a 115 HP Yamaha Four Stroke. She is fast, smooth, and comes with all the bells and whistles. Stereo systems, swim ladders, and beautiful seats. our our beautiful waters on a beautiful 2015 Tritoon boat! 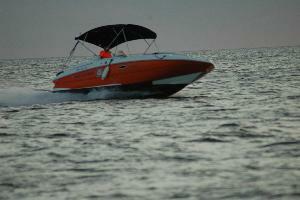 Powered by a 115 HP Yamaha Four Stoke. She is fast, soft, smooth, and comes with all the bells and whistles. Brand new 2017 Hurricane SS2200 (yes, she is 22 feet). Just Delivered. 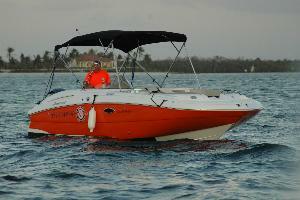 Immaculate bright orange 10 seater deck boat with 150 HP Yamaha 4-Stroke, Garmin GPS/Depth Finder & Blue Tooth Stereo. 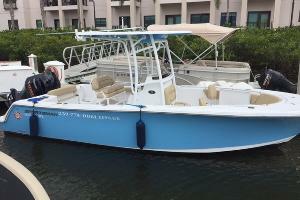 Beautiful 18.8' Hurricane Sundeck powered with 115 hp Yamaha Four Stroke. She is equipped with Garmin GPS and a nice brand new Infinity stereo. She has nice tan upholstery and a lot of space. 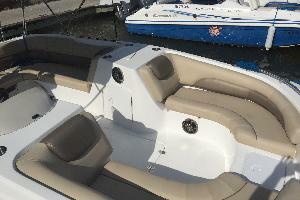 Immaculate Brand New 2017 23.2" Center Console Fishing Boat with 250 HP Yamaha 4-Stroke. 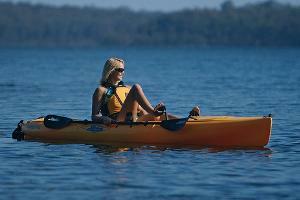 We use exclusively Hobie kayaks. They are all sit-on-top designs so you don't have to worry about stability. Mirage peddle drives also available for additional charge. 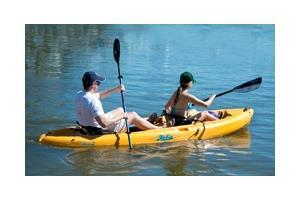 For our Tandem kayaks we use exclusively Hobie Kona models. They are all sit-on-top designs so you don't have to worry about stability. Mirage peddle drives also available for additional charge. Have you tried a Stand Up Paddleboard (SUP) yet? Take a 2-hour or half day trip up the Gordon River or out into Naples Bay and find out why everyone loves this new sport. 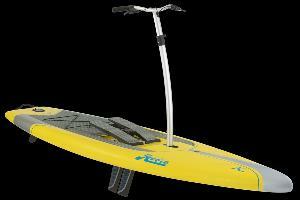 Amazing feet driven brand new steering stand up paddleboard. Great Fun - Great Workout. For adults and larger kids. Single speed all aluminum beach cruisers. All rentals come with helmet, front basket and combination lock. 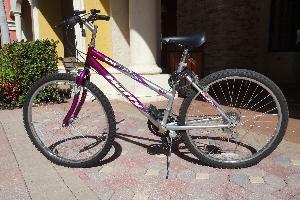 Sport gear bikes with hand brakes. Good for adults and older teens. Suggested routes map is also provided. 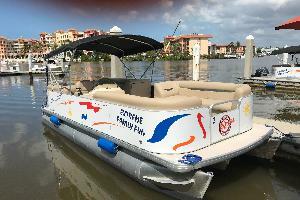 Extreme Family Fun Spot is the premier Naples family fun for Land N' Sea Adventures. Enjoy renting a boat for the day, rent a kayak another day, and follow it all up with a great Segway Tour of the Naples Area. We are a five year winner of the Naples Choice Award as the best family fun spot in the area! Come Join Us. You'll be having so much fun you'll never want to go home!!! I HAVE READ THIS ASSUMPTION AND ACKNOWLEDGEMENT OF THE RISK, RELEASE OF LIABIABILITY AND INDEMNITY AGREEMENT. I UNDERSTAND THAT BY PURCHASING THIS ACTIVITY, I HAVE ACCEPTED THE TERMS OF THIS RELEASE, I AM WAIVING VALUABLE LEGAL RIGHTS, INCLUDING ANY AND ALL RIGHTS I MAY HAVE AGAINST THE RELEASEES, THE OPERATOR NAMED ABOVE AND THEIR EMPLOYEES, AGENTS, INDEPENDENT CONTRACTORS, SERVANTS OR ASSIGNS AND INTEND MY PURCHASE OF ACITIVITY TO BE A COMPLETE AND UNCONDITIONAL RELEASE AND INDEMNITY TO THE GREATEST EXTENT ALLOWED BY LAW. TERMS AND CONDITIONS FOR BOAT RENTALS. 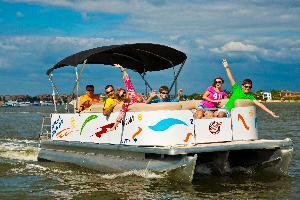 In consideration of the covenants herein contained, Extreme Family Fun Spot, the Rental Company, hereby leases to the undersigned lessee, the Renter (including any additional renter signatory hereto), upon the covenants, terms and conditions set forth on this agreement, the boat described above, hereinafter referred to as said vessel. 1. 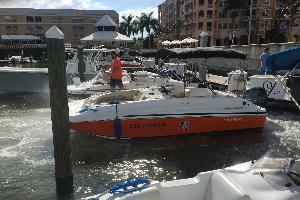 The Renter agrees to return said vessel to the Rental Company by the time shown in the Time in space. Overtime charges are billed at a rate of $50.00 per half hour. 2. 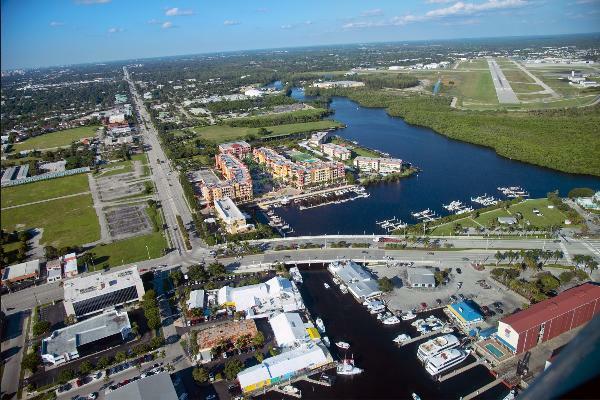 Navigation of power boats is confined to the inland and intracoastal waterways only between Naples Bay and the Jolly Bridge, Marco Island. 3. The Renter acknowledges the said vessel I is the rightful property of the Rental Company, and further acknowledges that he/she received said vessel in good and safe mechanical and seaworthy condition. The Renter agrees to return said vessel together with all accessories and accouterments to the Rental Company in the same condition as he/she received it. 4. 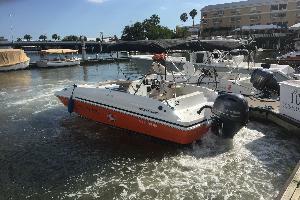 Said vessel is equipped with all USCG required safety equipment (life vests, buoyant cushion, anchor, fire extinguisher, flares and sound producing device.) Loss or damage to any of this equipment could result in additional charges. 5. The Renter agrees to pay the Rental Company the cost of replacing lost equipment and the cost of repairing damages to, and caused by, said vessel including parts, labor, expenses of transporting said vessel or other property to and from the point of repair, regular rental fee covering time said vessel is out of service as a result of damage, and any collection costs and/or attorney fees necessary to secure reimbursement. 6. It is agreed that the Rental Company is not responsible for the death or injuries sustained by any person including the Renter, Driver, or passengers arising out of or resulting from the use and operation of the said vessel, and the Renter agrees to indemnify the Rental Company for any loss sustained by the Rental Company whether or not such death, injuries or property damage are caused by or resulting from the negligence of the Rental Company and/or the unseaworthiness of said vessel or the use of said vessel by the Renter. 7. The Renter agrees to pay the Rental Company on demand all time, service, minimum, and other charges applicable to the rental of said vessel at the rates or in the amounts specified herein. 8. The Renter who signs to accept the terms of this Rental Agreement certifies that he/she is at least 22 years old. 9. The Renter agrees that use of said vessel by a number of persons greater than the number specified on the maximum occupancy label is prohibited. 10. 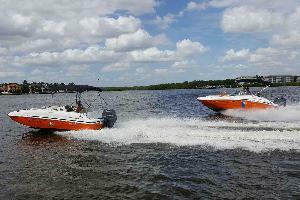 The Renter agrees not to use said vessel for water skiing, the pulling of tubes or other devices or towing of a vessel. 11. The Renter agrees to operate said vessel in a safe and legal manner as prescribed by all laws and regulations applicable to the area in which said vessel is operated. 12. The Renter agrees to pay all fines and/or fees for tickets issued by the Marine Police for speeding and/or unsafe usage of said vessel as well as fees associated with the towing, salvage or rescue of said vessel by secondary parties due to the negligence of the Renter or in the case of Acts of God, Renter agrees to pay 50% of the fee for towing. 13. The Renter agrees to pay all fuel and oil costs associated with the operation of said vessel. 14. All children under the age of 6 must be wearing a life jacket while onboard said vessel. This is Florida Law. I.	DISCLAIMER - This Waiver and Release Agreement is applicable to all renters, operators, passengers, and users of equipment provided by Rental Company. *(For purposes of this Waiver and Release, the term Rental Company includes all principles, directors, officers, employees, agents, representatives, servants, assigns, successors, insurers and subsidiaries of Rental Company). If any other rental agreement is supplemented with this Release, the provisions of this Release will prevail over any clauses in the rental agreements that are inconsistent with this Release. The undersigned agrees that he/she is also signing this Release on behalf of undersigneds minor children. Renter agrees that he/she will disclose to Rental Company all potential operators, passengers, and users of said rental equipment. Renter further agrees that in the event that he/she fails to notify Rental Company of all potential operators, passengers, or users of said equipment, he/she will be personally liable for any damages to the undisclosed individuals, even if such damages arise out of the negligence or fault of Rental Company. II. ACKNOWLEDGMENT OF RISKS - The undersigned hereby acknowledges that some, but not all of the risks of participating in watersport activities include: 1) Changing water flow, tides, currents, wave action and ships wakes; 2) Collisions with any of the following: other participants, the watercraft, other watercraft, and manmade or natural objects; 3) Collision, capsizing, sinking or other hazard which results in wetness, injury, exposure to the elements, hypothermia, drowning and/or death; 4) Attack by or encounter with insects and marine life forms, including, but not limited to sharks and/or sting rays; 5) Equipment failure or operator error; 6) My sense of balance, physical coordination, ability to operate equipment, swim and/or follow directions; 7) Wind, inclement weather, lightning, variances and extremes of wind, weather, and temperature, 9) Heat or sun related injuries or illnesses, including sunburn, sunstroke or dehydration. Further, the undersigned understands that the description of these risks is not complete and that unknown or unanticipated risks may result in injury, illness or death. III. EXPRESS ASSUMPTION OF RISK - The undersigned hereby agrees that he/she is renting, operating or using the equipment provided by Rental Company at his/her own risk. The undersigned agrees that he/she is voluntarily participating in all activities related to the rental, operation, or use of the rental equipment, The undersigned assumes full responsibility for the risks of personal injury, accidents or illness, including but not limited to sprains, torn muscles and/or ligaments; fractured or broken bones; eye damage; cuts, wounds, scrapes, abrasions, and/or contusions; head, neck, and/or spinal injuries; animal or insect bite or attack; shock, paralysis, drowning, and/or death; and any resultant expenses from any of the foregoing risks and assumes all risk of injury, illness, damage or loss that might result, regardless of the cause, even if the risks arise out of the negligence or fault of Rental Company. IV. WAIVER/RELEASE OF LIABILITY - By the execution of this Release, the undersigned voluntarily releases, forever discharges and agrees to indemnify and hold harmless Rental Company from any and all liability of any nature for any and all injury or damage arising from personal injuries sustained by the undersigned or any minor children under the undersigneds custody, care, and control, as a result of any and all activities related to the rental, operation, or use of equipment provided by Rental Company regardless of the cause. The undersigned assumes full responsibility for any such injuries or damages which may occur, and further agrees that Rental Company shall not be liable for any loss or theft of personal property. The undersigned specifically agrees that Rental Company shall not be responsible for such injuries, damages, loss or theft, EVEN IN THE EVENT OF NEGLIGENCE OR FAULT BY RENTAL COMPANY, whether such negligence is present at the signing of this Release or takes place in the future. This Waiver and Release does not apply to gross negligence or intentional torts by Rental Company. V.	LIABILITY TO THIRD PARTIES - The undersigned hereby agrees that he/she will indemnify and hold harmless Rental Company for all personal injuries, property damages, or any other damages to any and all third parties, including, but not limited to, operators and passengers of other watercraft and minor children under the undersigneds custody, care, and control, as a result of any and all activities related to the rental, operation, or use of equipment provided by Rental Company, even if such damages arise out of the negligence or fault of Rental Company. VI. ACKNOWLEDGMENT OF WAIVER AND RELEASE - The undersigned states that he/she has had sufficient time to review the Waiver and Release and to ask any questions associated with said Release. The undersigned further states that he/she has carefully read the foregoing Waiver and Release, knows the contents thereof, and has signed this Release as his/her own free act. The undersigned warrants that he/she is aware that he/she may rent, operate, or use equipment from another rental facility, but has chosen to rent, operate, or use equipment from Rental Company with the knowledge that signing this Release is a requirement for rental, operation, and use of said equipment. The undersigned further warrants that he/she is fully aware that he/she is waiving any right he/she may have to bring a legal action to assert a claim against Rental Company for Rental Companys negligence. 1. Acknowledgement of Risk. I (individually as signers of this contract) acknowledge SEGWAY RECREATIONAL ACTIVITIES ARE VERY DANGEROUS and involve the risk of SERIOUS INJURY and/or DEATH. Risks include, but are not limited to, traffic hazards, collisions, falling, inclement weather, equipment failure, operator error, all of which can cause serious injury, paralysis and/or death. EXPRESS ASSUMPTION OF RISK AND RESPONSIBILITY. I agree to assume responsibility of all the risks of the activity, EVEN THOSE ARISING OUT OF THE NEGLIGENCE OF THE THOSE RELEASEES NAMED BELOW. My/our participation of the activity is purely voluntary. I assume full responsibility for myself and any minor children for whom I am responsible, for any bodily injury, accident, illness, paralysis, death or loss of personal property even IF CAUSED, IN WHOLE OR IN PART BY THE NEGLIGENCE OF THE RELEASEES NAMED BELOW, to the fullest extent permitted by law. 2. RULES/REGULATIONS. 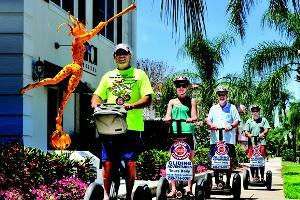 I understand that I am the only person authorized to operate any Segway machine provided to me. I will not allow anyone else to operate the Segway. I agree to wear a U.S. approved personal helmet while participating in the activity or riding on my Segway and will require any passengers to wear a helmet. I will comply with all rules and regulations for safe operation of the Segway. RELEASE I hereby release Permin & Associates, Inc. DBA Extreme Family Fun Spot, its principals, officers, agents, employees, volunteers, independent contractors and each and every landowner, municipal and/or government agency (collectively known as releasees upon whose property an activity is conducted, if any, FROM ANY AND ALL LIABILITY OF ANY NATURE FOR ANY AND ALL INJURY OR DAMAGE (INCLUDING DEATH) TO ME OR MY MINOR CHILDREN OR ANY OTHER PERSONS as a result of my/our participation in the activity, EVEN IF CAUSED BY THE NEGLIGENCE OF ANY OF THE RELEASEES NAMED ABOVE OR ANY OTHER PERSON (INCLUDING MYSELF) to the fullest extent permitted by law. 3. INDEMNITY I hereby agree to INDEMNIFY AND SAVE AND HOLD HARMLESS the releasees and each of them FROM ANY LOSS, LIABILITY, DAMAGE OR COST they incur arising out of or related to my participation in any Segway or Segway related recreational activities, WHETHER CAUSED BY THE NEGLIGENCE OF THE RELEASEES OR OTHERWISE. I HAVE READ THIS ASSUMPTION AND ACKNOWLEDGEMENT OF THE RISK, RELEASE OF LIABIABILITY AND INDEMNITY AGREEMENT. I UNDERSTAND THAT BY SIGNING THIS DOCUMENT, I AM WAIVING VALUABLE LEGAL RIGHTS, INCLUDING ANY AND ALL RIGHTS I MAY HAVE AGAINST THE RELEASEES, THE OPERATOR NAMED ABOVE AND THEIR EMPLOYEES, AGENTS, INDEPENDENT CONTRACTORS, SERVANTS OR ASSIGNS AND INTEND MY SIGNATURE TO BE A COMPLETE AND UNCONDITIONAL RELEASE AND INDEMNITY TO THE GREATEST EXTENT ALLOWED BY LAW. 1) Acknowledgement of Risk. I acknowledge BICYCLE ACTIVITIES ARE VERY DANGEROUS and involve the risk of SERIOUS INJURY and/or DEATH. Risks include, but are not limited to, traffic hazards, collisions, falling, inclement weather, equipment failure, operator error, all of which can cause serious injury, paralysis and/or death. 2) EXPRESS ASSUMPTION OF RISK AND RESPONSIBILITY. I agree to assume responsibility of all the risks of the activity, EVEN THOSE ARISING OUT OF THE NEGLIGENCE OF THE THOSE RELEASEES NAMED BELOW. My/our participation of the activity is purely voluntary. I assume full responsibility for myself and any minor children for whom I am responsible, for any bodily injury, accident, illness, paralysis, death or loss of personal property even IF CAUSED, IN WHOLE OR IN PART BY THE NEGLIGENCE OF THE RELEASEES NAMED BELOW, to the fullest extent permitted by law. 3) RULES/REGULATIONS. 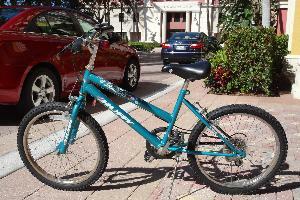 I understand that I am the only person authorized to operate any Bicycle provided to me. I will not allow anyone else to operate the Bicycle. I agree to wear a U.S. approved personal helmet while participating in the activity or riding on my Bicycle and will require any passengers to wear a helmet. I will comply with all rules and regulations for safe operation of the Bicycle. 4) RELEASE I hereby release Permin & Associates, Inc. DBA Extreme Family Fun Spot, its principals, officers, agents, employees, volunteers, independent contractors and each and every landowner, municipal and/or government agency (collectively known as releasees upon whose property an activity is conducted, if any, FROM ANY AND ALL LIABILITY OF ANY NATURE FOR ANY AND ALL INJURY OR DAMAGE (INCLUDING DEATH) TO ME OR MY MINOR CHILDREN OR ANY OTHER PERSONS as a result of my/our participation in the activity, EVEN IF CAUSED BY THE NEGLIGENCE OF ANY OF THE RELEASEES NAMED ABOVE OR ANY OTHER PERSON (INCLUDING MYSELF) to the fullest extent permitted by law. 5) INDEMNITY I hereby agree to INDEMNIFY AND SAVE AND HOLD HARMLESS the releasees and each of them FROM ANY LOSS, LIABILITY, DAMAGE OR COST they incur arising out of or related to my participation in any Bicycle recreational activities, WHETHER CAUSED BY THE NEGLIGENCE OF THE RELEASEES OR OTHERWISE. 6) DAMAGE I am responsible for any loss or damage to equipment. 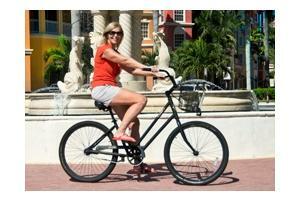 Each renter will be provided a helmet and lock for use during rental. Lost or damaged helmet are charged at $25.00 per helmet, lost locks are charged at $18.00 per lock, lost map charged at $5.00. Damage to bicycles will be assessed and paid for at check-in. 1. I acknowledge that sea kayaking or canoeing entails known and unanticipated risks that could result in physical or emotional injury, paralysis, death, or damage to myself, to property, or to third parties. I understand that such risks simply cannot be eliminated without jeopardizing the essential qualities of the activity. The risks include, among other things: boat capsize and entrapment; tidal conditions, surf and currents; travel in remote areas; collision with objects or other watercraft; prolonged exposure to cold water, hypothermia, accidental drowning; illness in remote areas; exposure to sun, strong wind, cold, storms, large waves, eddies and whirlpools, and lightning; aggressive and/or poisonous marine life; wrist, arm, shoulder, and/or back injuries, including repetitive motion injuries; slips and falls while walking, getting in or out of kayaks from land or a dock; slip or fall while approaching or walking on a dock; rapidly changing adverse weather and water conditions; being lost at sea. Furthermore, SWS, its employees or agents have difficult jobs to perform. They seek safety, but they are not infallible. They might be unaware of a participant's fitness or abilities. They might misjudge the weather or other environmental conditions. They may give incomplete warnings or instructions, and the equipment being used might malfunction. 3. I hereby voluntarily release, forever discharge, and agree to indemnify and hold harmless SWS and the property from any and all claims, demands, or causes of action, which are in any way connected with my participation in this activity or my use of SWS's equipment or facilities, including any such claims which allege negligent acts or omissions of SWS or the property. 4. Should SWS, the property, or anyone acting on their behalf, be required to incur attorney's fees and costs to enforce this agreement, I agree to indemnify and hold them harmless for all such fees and costs. 6. In the event that I file a lawsuit against SWS or the property, I agree to do so solely in the state of Florida, and I further agree that the substantive law of Florida shall apply in that action without regard to the conflict of law rules of that state. I agree that if any portion of this agreement is found to be void or unenforceable, the remaining document shall remain in full force and effect. By participating in this activity, I acknowledge that if anyone is hurt or property is damaged during my participation in this activity, I may be found by a court of law to have waived my right to maintain a lawsuit against SWS and the property on the basis of any claim from which I have released them herein. I understand also that the kayak(s) has been rented to me and I am solely responsible for any use of the kayak(s) by any other persons. I also agree to pay for any and all damages to the kayak and equipment that I have rented. I have had sufficient opportunity to read this entire document. I have read and understood it, and I agree to be bound by its terms. Acknowledgement of Risk. I (individually as listed participants of this contract) acknowledge BOATING AND LAND BASED ACTIVITIES ARE VERY DANGEROUS and involve the risk of SERIOUS INJURY and/or DEATH. Risks include, but are not limited to, traffic hazards, collisions, falling, inclement weather, equipment failure, operator error, all of which can cause serious injury, paralysis and/or death. RULES/REGULATIONS. I and all friends, family or associates attached to this reservation agree to obey all rules and regulations aboard the vessel issued by the crew. INDEMNITY I hereby agree to INDEMNIFY AND SAVE AND HOLD HARMLESS the releasees and each of them FROM ANY LOSS, LIABILITY, DAMAGE OR COST they incur arising out of or related to my participation in any Extreme Family Fun Spot related recreational activities, WHETHER CAUSED BY THE NEGLIGENCE OF THE RELEASEES OR OTHERWISE. I HAVE READ THIS ASSUMPTION AND ACKNOWLEDGEMENT OF THE RISK, RELEASE OF LIABIABILITY AND INDEMNITY AGREEMENT. I UNDERSTAND THAT BY PURCHASING THIS ACTIVITY, I HAVE ACCEPTED THE TERMS OF THIS RELEASE, I AM WAIVING VALUABLE LEGAL RIGHTS, INCLUDING ANY AND ALL RIGHTS I MAY HAVE AGAINST THE RELEASEES, THE OPERATOR NAMED ABOVE AND THEIR EMPLOYEES, AGENTS, INDEPENDENT CONTRACTORS, SERVANTS OR ASSIGNS AND INTEND MY PURCHASE OF A TICKET TO BE A COMPLETE AND UNCONDITIONAL RELEASE AND INDEMNITY TO THE GREATEST EXTENT ALLOWED BY LAW.